University of Miami motion pictures students were exposed to a piece of Hollywood while working with filmmaker Robert Townsend. Townsend is an actor, writer and director who has produced films including “Hollywood Shuffle,” “The Five Heartbeats” and “The Meteor Man.” He has also worked with stars like Halle Berry, Morgan Freeman and Denzel Washington. Production on the film, “Playin’ for Love,” took place across Miami this December and January. Beyond the professionals, the production crew for the basketball-centric romantic comedy included about 20 UM students and additional high school students from the Overtown community, a low-income area of Miami. “Everyone won on this. I found it a very nice collaboration,” said Ed Talavera, director of the Department of Cinema and Interactive Media. Noah DeBonis, who is pursuing his master’s in motion pictures, assisted with lighting on set. He saw it as an exciting opportunity to work alongside a legend like Townsend. “Watching people do their work helps you see the way that they do things, and you learn from that,” he said. With dozens of students expressing interest in the project, applicants were asked to submit an essay explaining how they would benefit. Brittany Hickey, a junior majoring in motion pictures and advertising, was one of the students chosen. “I said that I came from a small country-town in Michigan, and this opportunity was one in a million for me personally,” she said. Townsend saw the project as beneficial exposure for the participants. Townsend cared about the filmmaking project being an optimal educational experience for the people involved, Hickey said. 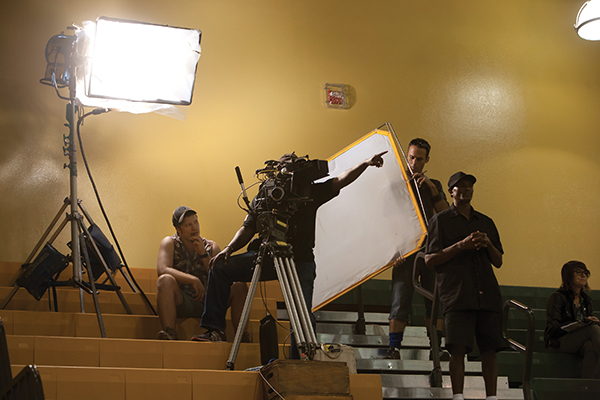 Hickey’s favorite day on set was shooting the basketball sequences in the gym. High school students from Overtown also worked on set. Because the movie is about a high school basketball team, some of them also acted in the basketball scenes, according to Talavera. DeBonis said the Overtown students seemed very excited to be working on the project. Simply by being there with the professionals, Hickey felt she learned much more in the span of a month than she could have in an entire semester of school. “School can teach you the basics, but you can’t understand the real way it works in a motion picture unless you’re there doing it hands on,” Hickey said. Rianna Hidalgo contributed to this report.